A New Beginning for machines and hands… Among contemporary furniture manufacturers, Mattiazzi, the family owned producer of wooden furniture in Udine, Italy, is unusual. While many producers in that region rely on third party factories and work in diverse materials, Mattiazzi operates with their own machines and hands, and has developed a healthy obsession for woodworking. Since 1978, when brothers Nevio and Fabiano Mattiazzi founded the company, Mattiazzi has steadily cultivated its local manufacturing culture. Their network of wood shops is diverse enough to support any manufacturing process the brand may need. Every shop has its own focus, from milling to lacquering, and a particular process always belongs to a specific part of town. But don’t let the neighbourhood approach confuse you: Mattiazzi is no backyard shop. Their highly specialised craftsmen operate the most sophisticated machinery available to the wood industry. An eight-axis CNC milling machine allows wood to take the complex shapes associated with injection-moulded plastic. Operating such a machine is an art and Mattiazzi disproves the modern myth that mechanised manufacturing is not a craft. 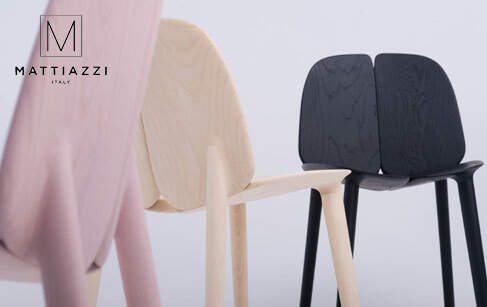 For thirty years Mattiazzi worked exclusively as a subcontractor for other brands and built a reputation in the furniture industry for making the most challenging wooden products. They bring their expertise with them as they take their first steps into the role of an independent, holistic brand. They have hired a young Munich-based office, Studio Nitzan Cohen, to design their first pieces. These designs push and exploit the potential of Mattiazzi’s craft. Berlin-based graphic designer Florian Lambl is art director for the brand, building from their heritage and helping them to create a new tradition. Mattiazzi is extending the reach of their machines and hands, and their new direction is an exciting twist in a story that was already worth following.